There is a quaver of nervous excitement in Another Round co-host Tracy Clayton’s voice at the start of the episode, making it clear that something extra special is in store. On this entry of the beloved BuzzFeed podcast, Clayton and co-host Heben Nigatu are graced with an extremely timely interview from the multifaceted rapper Remy Ma on the heels of her epic Nicki Minaj diss track, “shETHER.” The conversation showcases precisely what makes this podcast a continual delight, from Clayton’s awkward attempt to shoehorn her current ovulation into a segue, to Remy’s candidly emotional discussion of the years she spent in prison. It is a jam-packed affair with amazing moments of hilarity, sadness, advice, and revelations. The ostensible centerpiece is a discussion of the events that led Remy to record “shETHER” and how it runs counter to her beliefs on solidarity among women in hip-hop. But what follows is perhaps even more important, as Remy opens up about a recent issue with an ectopic pregnancy that opened her eyes to health-care disparities and how insurance coverage addresses in vitro fertilization. Chris Gethard, although sincere and passionate, is rarely one to become outright angry. In this week’s episode of Beautiful/Anonymous, he cannot contain himself as the caller tells him about an “inappropriate” relationship she had with a former teacher. She describes how, as a 13-year-old, the pair would engage in late-night AIM conversations and heavy flirtation. The relationship grew physical by the time she was 15 (they would make out in his car), but she assures Gethard it never went further than that, defining it as more of an emotional relationship. The caller insists she’s never felt scarred by what happened, laughing off various aspects of the story in a way that comes across reflexive. Gethard grows increasingly distressed as he hears details about the teacher, like his being middle-aged and married, but maintains his empathy and self-awareness, never directly condemning the woman’s perspective. Gethard keeps himself fully open to the caller, even as she refuses to acknowledge her experiences as abuse. It’s a balancing act that makes the episode compelling, and it’s a telling portrait of someone who might only just now realize they were a victim. Though Crimetown has spent its first season unfurling the epic collusion of mafiosi and government within Providence, Rhode Island, the latest episode can be easily enjoyed as a one-off, requiring little context from the rest of the series. It’s 1981, and mob boss Raymond Patriarca awaits trial for allegedly ordering two executions years earlier. At 73, he’s long battled health issues, but it’s an open question as to how many of the symptoms he presents are merely a performance. Patriarca becomes a patient of Dr. Barbara Roberts, Rhode Island’s first female cardiologist, and Roberts’ medical testimony keeps Patriarca from facing the rigors of trial. Roberts’ role within the Patriarca crime family soon runs ever deeper as she is introduced to the charming, worldly Luigi Manocchio, a younger man with none of the boss’ health issues. Roberts and Manocchio begin a clandestine courtship, which takes on extra layers of intrigue when Manocchio begins to face legal troubles of his own. The H.P. Lovecraft Literary Podcast has long since run out of stories from Rhode Island’s most prolific cosmic horror author to cover on their show. The hosts wrapped up their analysis of Lovecraft’s last story, “The Haunter Of The Dark,” way back in June of 2012, but the podcast has somehow managed to press on for another five years. A small part of their methodology involves top-notch full readings performed by professional actors, complete with atmospheric music and sound effects, but their main tactic is even more simple: They just expanded their focus. They now devote their time to examining—with equal measures reverence and irreverence—the stories that inspired Lovecraft or ones that share his worldview, and Mary Shelley’s Frankenstein happens to be both. This is the first of a four-part look at one of the most influential novels ever written. This being Women’s History Month, it’s a good time to look closely at the efforts of a 19-year-old woman who helped shape a genre. Since the story’s film adaptations loom so large, it’s nice to be reminded of how it looked on the page. One method Donald Trump has used to demonize foreigners is to portray them as a monolithic group crossing our borders with malicious intent. An undocumented Mexican immigrant isn’t always considered as a unique individual, much less as a person with, say, a flair for poetry and an encyclopedic knowledge of Destiny’s Child. And that’s what makes this a vital podcast. Its host, Maeve Higgins, is an Irish comedian currently living in New York City on a three-year visa. As for everyone else in her position, life just got a little more harrowing for her. With ample positivity and humor, she brings that understanding to a podcast devoted to documenting the immigrant experience. In this live episode—which is a bit lighter than usual due to the audience—she talks to (among others) Yosimar Reyes, the undocumented Mexican described above. Every beat of their conversation makes it more appalling to think that this man could be sent back to a country he left at age 3 if he should turn the wrong corner tomorrow. Four episodes into Dan Taberski’s exposé on the cloistered, tank-topped titan, we’re not much closer to finding any answers. But while this week’s installment can’t equal the bombshells dished out in the previous episode—including accusations of witchcraft—it does reveal a fascinating overview of Simmons’ biography. Richard, born Milton Teagle Simmons, is the son of a 4’10” fan-dancing mother and a sporadically employed nightclub emcee father. The whole family was devoutly religious, and we hear some clips of Simmons’ later fitness evangelism that bear more than a passing resemblance to the come-to-Jesus rhetoric used by megachurch faith healers. Before he became that person, however, he was an obese 8-year-old working in a New Orleans praline confectionery. Only after a masochistic crash diet later culminated in hospitalization did Simmons start down the path of tireless health advocacy. His brother, Lenny, was one of the precious few people Richard maintained a relationship with throughout, so Taberski naturally meets with Lenny for any insight into why Richard the crusader is no longer around. 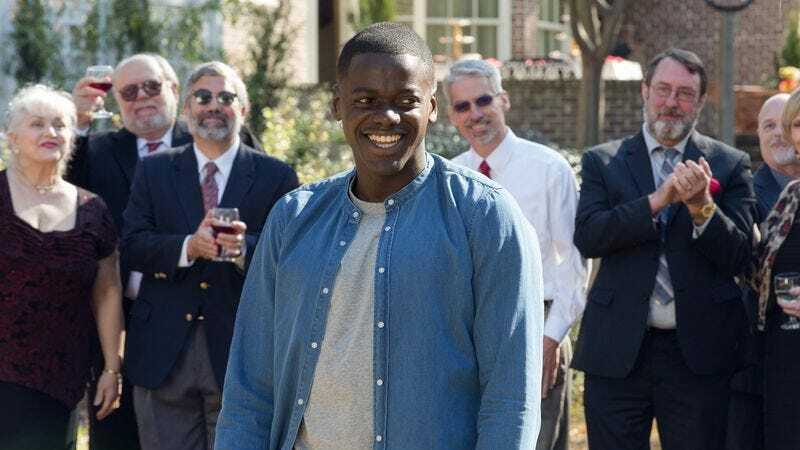 By now, most people who have seen or are excited to see Get Out have already heard all the reasons why it’s fitting for a comedian to choose a horror film as his directorial debut: Comedy and horror are two sides of the same coin, both utilize tension and release, etc. That’s all touched upon in Elvis Mitchell’s interview with Key & Peele’s Jordan Peele, but the really interesting aspect of this conversation is the two men’s back-and-forth about how fundamental race issues are to the heart of this film. In the hands of a less thoughtful filmmaker, the story of a black guy spending time at his white girlfriend’s parents’ house could very easily devolve into a gimmick, and an offensive one at that. But it’s very clear that Peele had the necessary vision to make a transcendent work of horror. He understands the mechanics of a horror film as well as he does that of a comedy sketch, speaking with a comfortable confidence unusual to first-time directors.